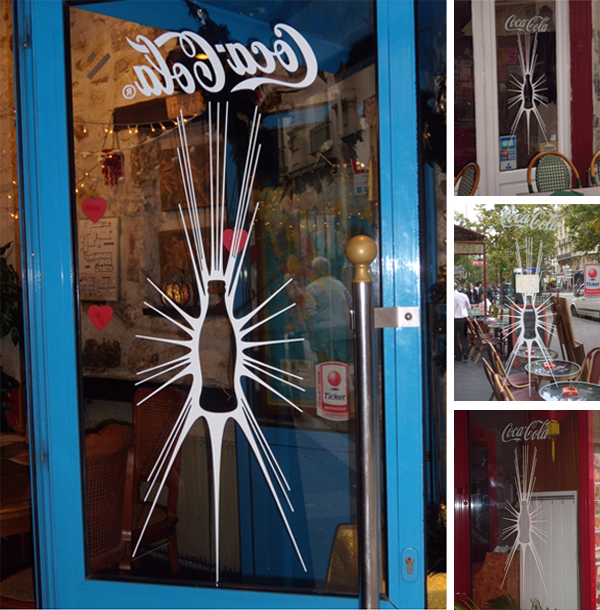 Walking the streets of Paris recently I was struck by the appearance of the latest point of sale campaign for Coke. It wasn’t the visual language of the campaign that struck me, nor a stunning creative execution, there were no bronzed & cut young French guys or girls. In fact what struck me wasn’t anything that I saw, more what I didn’t see. There was no photographic image, no brand colours, no copy line, strictly speaking there was not even a product shot – an unusual approach for retail point of sale to say the least. The window decals feature a burst of light with the shape of the iconic coke bottle reversed out of the center. Above the graphic sits a white version of the equally iconic Coke brand mark. The unique shape of the bottle has become so synonymous with Coke that they can run a retail campaign based around that brand property as the hero, and the brand mark is so recognizable it can be presented in virtually any form. Coke as a brand has built three highly recognizable and highly effective brand properties: the Coke brand mark; the Coca Cola red; and the iconic Coke bottle shape. These properties provide instant customer recognition when used individually or in combination. Whilst Coke has spent hundreds of millions of dollars over decades to build these brand properties, their success is not purely a result of time and money. Consider a comparison with the Pepsi brand which has spent similar buckets of cash over the last thirty years building customer awareness. What brand properties does Pepsi have as a result of their investment? Yes they have a brand mark, but not one as unique or identifiable as the Coke brand mark. Over time Pepsi has failed to build ownership of a brand colour in the way Coke owns Red, Fanta owns Orange, and Sprite owns green. Finally, there is nothing iconic about the Pepsi can or for that matter any other property that has been developed and marketed for the purposes of the Pepsi brand. The failure on the part of Pepsi to build remarkable brand properties has not been for lack of effort or dollars, but as a result of a lack of understanding of one of the basic principals of branding; building brand properties. The Coke/Pepsi comparison serves to remind us all that no-matter the size of our business, our brands and our marketing budget, by developing unique and memorable brand properties we are able to fully leverage the value of our brand building efforts. If you’d like some help identifying your brand’s unique properties or developing strategies to create and leverage properties for your brand, give us a call. Coke vs Pepsi is one of the all time great branding battles. I think you are being a bit harsh on Pepsi. Let’s not fool ourselves into thinking that Coke has never done anything wrong – we all still remember New Coke. One of my favorite cola war ads. Jane, That’s a ripper ad – I think part of what’s been so enjoyable about the Coke V Pepsi war for the consumers has been the spirit of competition. If anyone’s not seen this ad, click the ink on Jane’s comment – it’s well worth the 30 seconds. Sarah, Don’t get me wrong, the Pepsi V Coke battle of the brands continues to be a classic – and as you point out Coke has made some blues along the way too. My point is that with all of the investment made by both brands during the battle, Pepsi has failed to build anything like the type of visual properties that Coke has. Brands that build properties they can own in the marketplace (like Coke’s colour red, brand mark and bottle shape) are able to get so much more leverage from their marketing spend as a result. That is the lesson all brands should take from the Coke V Pepsi battle. How good is that Pepsi ad posted by Jane. Classic! Pepsi, Coke all tastes the same with Bourbon. Good article Tim, well worth the read. It also shows graphically the different approaches in terms of developing the brand marks of Pepsi & Coke as a property. Whenever Coke moved too far off-line they corrected themselves back to the authenticity of their original mark, where-as Pepsi appear to be happy to just follow the trends of the time and have ended up with not much of a brand mark property to own. Are you talking about this comparison from just an Australian viewpoint? It is important to look from a global perspective. At times I am guilty of taking a narrow view too. I love how fun and simple this is, great! Sarah, You make a good point about often having a view coloured by Australia’s isolation, but I don’t think that’s the case on this occasion. This article was written from Paris where I was struck by how much greater the visual presence of Coke was (entirely due to this widespread POS campaign) relative to Pepsi or any other brand of drink. Interesting post, thanks. I agree with the brand properties argument. Coke’s main brand asset’s are the result of considerable investment in elements closely linked to the actual product. Packaging, design, form etc. All things that you can touch, hold, feel, see and that evolve each time they’re changed. Pepsi have struggled to ‘own’ their product and have focused on advertising, sponsorship and association, much less tangible and with a much shorter lifecycle. Good concise summary Andy. It still amazes me that ‘brand’ is such an inconsistently understood and applied practice, even at the Coke/Pepsi level of the game.